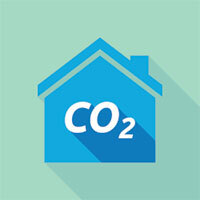 If you have a heating appliance that burns fuel – and if you live in Maryland and don’t use solar energy throughout your home, you do – then some amount of carbon monoxide (“CO”) is produced inside your home. Carbon monoxide (CO) is an odorless gas produced by burning fuel, including heating oil, gasoline, coal, wood, charcoal, kerosene, propane, or natural gas. With properly functioning equipment, burning fuel inside your home is perfectly safe because CO vents outside your home before it can accumulate. CO buildup usually occurs for two reasons: poor ventilation or damaged / improperly maintained heating equipment. If exposure to CO is acute enough, CO poisoning can occur. Symptoms of CO poisoning vary depend on the amount of exposure to the gas. In extreme cases, symptoms include unconsciousness, convulsions, and in rare cases, death. Get fresh air immediately; open windows and leave the house. Nothing is more important than keeping our QDog customers safe! If you have any questions or concerns about CO in your home, contact us immediately – we’re happy to help.